Nairobi Governor Mike Sonko on Monday made an impromptu visit to Pumwani Hospital and uncovered 12 corpses of infants hidden in boxes. The bodies were wrapped together in polythene bags and stuffed in three boxes inside a store as opposed to a mortuary. One box contained one body, another six and another five. Mr Sonko visited the facility on a boda boda, catching the management off guard. He said the visit was prompted by a video he had received showing some members of the administration ferrying bodies from the wards. 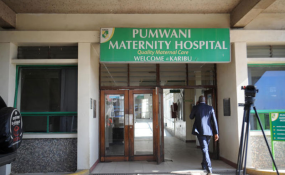 "Conducting impromptu visit at Pumwani Hospital, where it's alleged by members of the public that the management shut down the machines at the Maternity Wing, leading to loss of lives of young ones," he said during the raid. "I want to categorically state that human life must be respected no matter the case. Stern action will be taken against anyone found to be sabotaging the good services offered to our mothers and sisters who come to deliver in this facility." But Mr Sonko said he had credible information that there were more. He then ordered one of the workers to open the boxes where six more were found. Buoyed, the county boss asked the man to open another box where five more bodied were found. After the raid, Mr Sonko alerted senior police officers to look into the matter. "This is a police matter. You can't lose 12 babies in a day," he said.